The International Order of Good Templars is a temperance organisation, founded in the United States in 1851. Vignette (top): The parable of the Good Samaritan. Vignettes (clockwise from bottom): First drink – social. Second drink at a bar. Drinking & gambling. Goes home drunk to young wife. Pawns his clothes. Poverty & delirium. Recovery – signs the pledge. Prosperity & happy home. 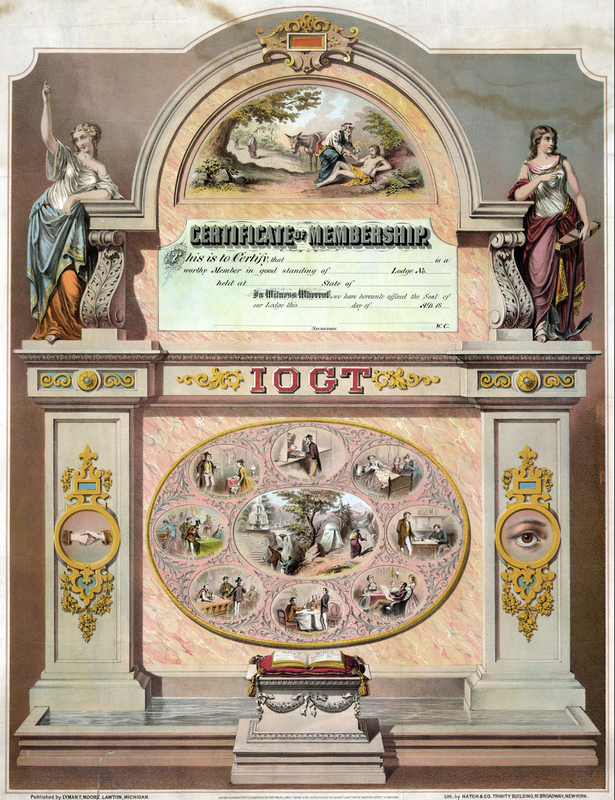 Certificate of Membership: This is to Certify, that — is a worthy Member in good standing of — Lodge N° — held at — State of —. In Witness Whereof, we have hereunto affixed the Seal of our Lodge this — day of — A.D. 18 —. Secretary. W.C. In 1875 the Order established a branch, the ‘Never Surrender’ Lodge in the small mining settlement of Lamplough, in central Victoria. 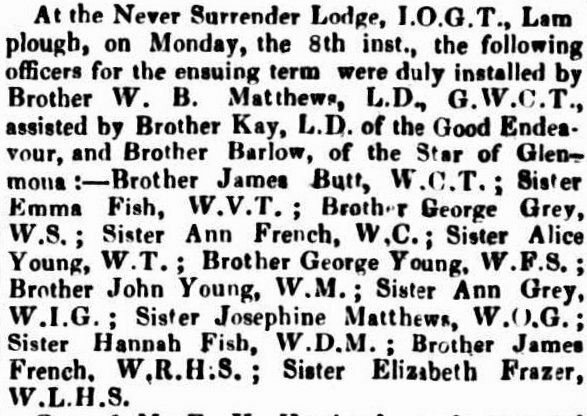 My husband’s 3rd great grandfather, George Young (1826-1890), and George’s son John (1856-1928), both gold miners, became officers of the Lodge. George’s daughter Alice (1859 – 1935) , aged 17, was also a member, holding the office of Worthy Treasurer. George was Worthy Financial Secretary and John was Worthy Marshall. 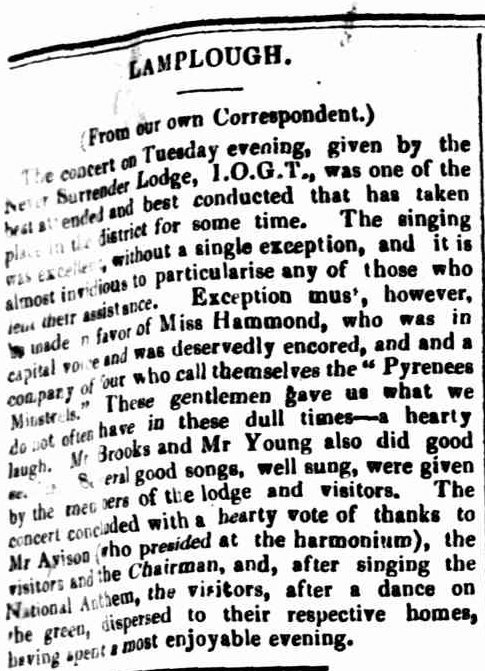 In 1876 the Avoca Mail reported that at a concert put on by the Lodge, Mr Young—presumably either George or his son John—‘did good [unreadable]’. From the context it appears that his performance was either a song or two or perhaps a few jokes. It is a little frustrating not to be able to read the badly scanned text. 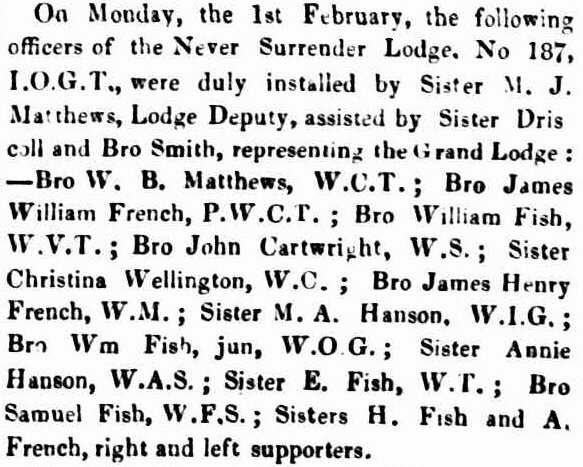 The International Order of Good Templars still exists, but I have found no more newspaper mentions of the Lamplough Lodge after this one in 1876; I don’t know when it dissolved.